Knowledge of anatomy of the caudate lobe and its relationship with the porta hepatis area are mandatory for a correct surgical approach to hilar cholangiocar-cinoma. In fact, the surgical treatment of this disease requires en-bloc resection of the caudate lobe. Nimura  has proposed naming Segment 1 on the left: S1l; segment 9 on the right: S1r; caudate process: S1c (Fig. 8). The right and left caudate lobe are separated by the Arantius canal or ligamentum venosum, an embryonic vein coming from the base of the umbilical portion that enters the left hepatic vein, or the common trunk of the left and middle hepatic vein or directly into the inferior vena cava. 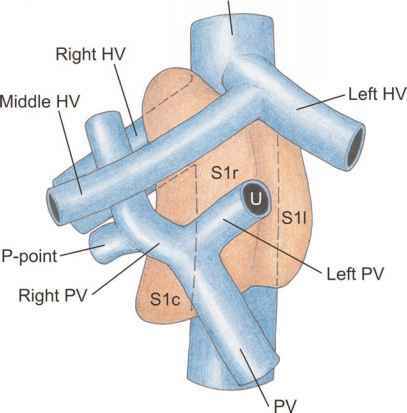 The right lateral margin of S1r is on the left site of the right posterior portal vein, and the superior margin extends up towards the diaphragm, crossing middle and right hepatic veins. 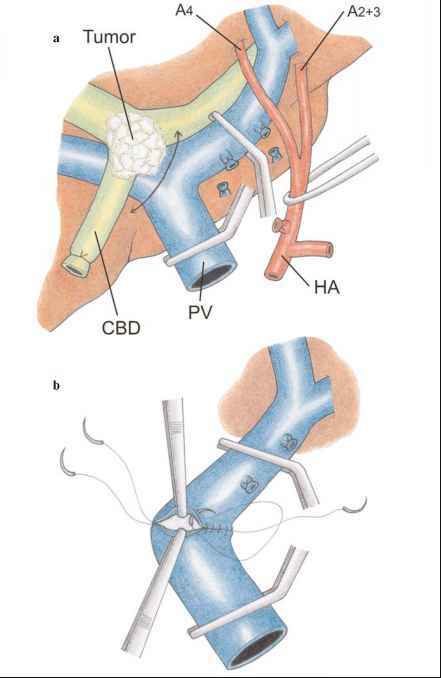 The small arteries for the caudate lobe originate directly from the right and left hepatic artery. 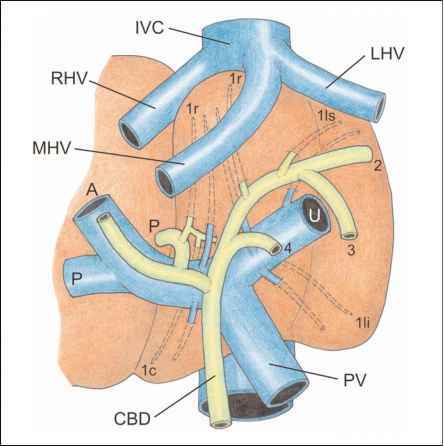 The portal component is variable: from two to six vessels come from the left portal vein, two or three small vessels come from the right portal vein, finally one or two vessels arise from the main trunk or portal bifurcation. Venous drainage consists of short hepatic veins, variable in number and size (1-6 mm), that open into the vena cava, with a very short course of a few millimeters. Lastly, some small venous rami (two or three) coming from the right caudate lobe (S1r) directly join the middle hepatic vein.